The Scoop: Mike Goldstein became known as the EZ Dating Coach because his goal is to make dating — particularly online dating — easier for singles who want a relationship. His personalized coaching style has impacted many people’s lives, and he boasts an impressive 83% success rate among his clients. Mike isn’t satisfied helping one person at a time, however. He has also launched dynamic webinars and informational content to bolster daters who are in need of advice. His efficient dating system has made getting a date much easier for those willing to take his advice and apply his proven methods to their love lives. As a dating professional, Mike stands out for his dedication to his clients, his incredible success rate, and his pragmatic approach to finding a quality date. Mike Goldstein, also known as the EZ Dating Coach, never takes on more than 15 clients at a time in his private coaching business. He doesn’t want to overload himself with so many people that he can’t provide the personalized support that truly makes a difference in someone’s life. You won’t find any group coaching sessions on Mike’s calendar. He’s all about one-on-one sessions with singles who feel motivated to improve themselves and find love any way they can. While Mike doesn’t usually meet with his clients in person — because they live all over the world — he works closely with them on Skype and Zoom for up to six months at a time. The typical client schedules a session with him once every two weeks. Mike operates a hands-on coaching program designed to yield results in the dating scene. This dating professional prepares singles to tackle online and offline dating scenarios with confidence by using his signature system. He doesn’t give out homework assignments so his clients can figure things out themselves. Instead, he guides them every step of the way — sometimes typing out or editing messages for them on a shared screen — and ensures they don’t make mistakes while seeking a loving relationship. Mike’s webinar teaches singles how to get in a relationship within 90 days. 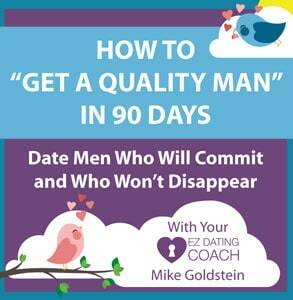 Mike said his most valuable gift to the dating public is his his free webinar, which outlines how to get a quality man in 90 days. This 50-minute video packs Mike’s trademark dating system into an easy-to-follow step-by-step process. The dating coach underscores the major points of understanding dating dynamics and seeking a compatible partner. He tells his audience everything from what to text after a date to how to avoid common mistakes when getting into a relationship. Mike’s webinar basically offers single women a crash course to dating. Participants can register with a name and email address, and then they’ll choose a date and time that works for their schedules. This online course makes Mike’s coaching more accessible to people who can’t afford traditional one-on-one coaching but still want to transform their dating lives. The structured setup of the EZ Dating Coach can help inexperienced daters learn the basics and figure out how to move forward. That’s helpful for young, active daters in their 20s or so, but it’s also incredibly valuable for a more mature audience of singles who are recently divorced or widowed. Singles over 60 often view dating again with trepidation. They’re intimidated by online dating and overwhelmed by how many options there are today. So they turn to Mike to make things easier to understand and navigate. Mike said he has seen an recent uptick in the number of clients over 60 enlisting his services. He said he’s glad to help these individuals come into their own and reclaim their love lives. Mike puts dating into concrete terms and recommends specific actions that singles can take to increase their proficiency on dating sites and become more confident in all social situations. One of Mike’s most successful techniques is the 50-12-1 System, which encourages singles to send 50 messages, narrow that down to 12 conversations, and go on one date each week. It’s a simple system that requires a little effort but yields fantastic results. In addition to glowing testimonials, the EZ Dating Coach proves its worth by touting impressive stats, most notably that 83% of clients end up in a relationship. Not many dating coaches can put a percentage on their success rates, but Mike has been tracking his for years. Mike said part of the reason he has been so successful as a personal dating coach is due to his thorough vetting process. 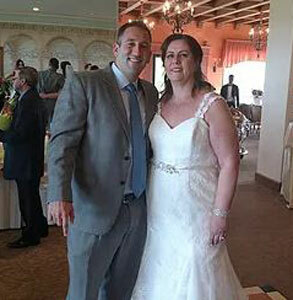 A former client named Isabella invited Mike to her wedding a few years ago. Every prospective client must go through a complimentary 15-minute introductory call as well as an in-depth follow-up call that usually lasts an hour and a half. During this call, Mike is looking to establish two things: 1) that the person wants to work with him and 2) that he wants to work with them. The second part isn’t always a given because Mike is selective about who he takes on as a client. He will only commit to working with someone if he feels confident that he can help that person find the relationship they’re looking for. Mike establishes a good relationship with his clients and often hears back from happily settled individuals who want to update him on their lives. Over the years, Mike has seen many former clients gain confidence and get in relationships. He said he knows of at least 11 clients who have gotten married after working with him. Mike is an accomplished dating coach with the stats to prove his dating system works. Over the last several years, the EZ Dating Coach has embarked on a mission to make every aspect of dating easier for the modern single person. He has worked with men and women from all walks of life and set them up for success in all their romantic ventures. In recent years, Mike has endeavored to make his one-on-one coaching advice more accessible to singles across the web, and his dynamic coaching programs and videos have inspired countless individuals to take control of their love lives.